Ankle sprains are common injuries that occur when ligaments are stretched or torn. The ankle sprain is the most common athletic injury. 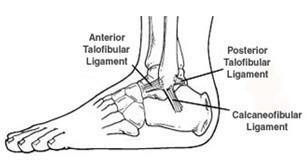 Nearly 85% of ankle sprains occur laterally, or on the outside of ankle joints. Sprains on the inside ligaments are less common. Many sprains occur when participating in sports, or by twisting the ankle when walking on an uneven surface. Some individuals, due to their bone structure or foot type, are more prone to ankle sprains. The tibia, fibula and talus are connected to each other by ligaments. Think of ligaments as thick rubber bands that hold bones together so that joints are stable and function properly. When an ankle is sprained, a ligament is stretched, partially torn or completely torn. Muscle and tendon structures surround the ligaments. These structures provide motion of the ankle joint for walking and running. Blood vessels, nerves and skin overlie the ligaments and tendons. The ankle joint moves the foot upward and downward. Just below the ankle joint is a ball and socket type joint that allows inward and outward motion. Initial treatment includes rest, ice, compression and elevation (RICE). The "RICE" method promotes healing, decreases pain, and reduces swelling around the ankle joint. In more severe cases, non-weight bearing activities are encouraged and crutches may be recommended. Compression may be achieved with an elastic bandage, splint, short leg cast or brace, depending on severity. Compression eliminates motion around the ankle joint. The ability to walk or participate in other weight bearing activities during the healing process depends on the severity or type of ankle sprain. This is determined by the podiatric surgeon once the diagnosis is made. Most ankle sprains heal in three to eight weeks. In more severe cases, ligaments may require more healing time to promote ankle stability. Repeated ankle sprains may cause chronic instability, interfering with walking or sports activities. In this case, the podiatric surgeon may recommend a surgical procedure to tighten or create new ligaments around the ankle joint to re-establish stability of the ankle joint. The adage "it is better to break an ankle than sprain one" need not apply if the injury is appropriately diagnosed and treated by the podiatric surgeon. Properly treated, the rehabilitated ankle can tolerate normal activities and the stress of participating in sports. The podiatric surgeon is a foot and ankle specialist who diagnoses foot and ankle conditions and determines appropriate treatment. While these are some of the most commonly prescribed treatments for ankle sprains, others may be used. The podiatric surgeon will determine which treatment is likely to be the most successful in each case.